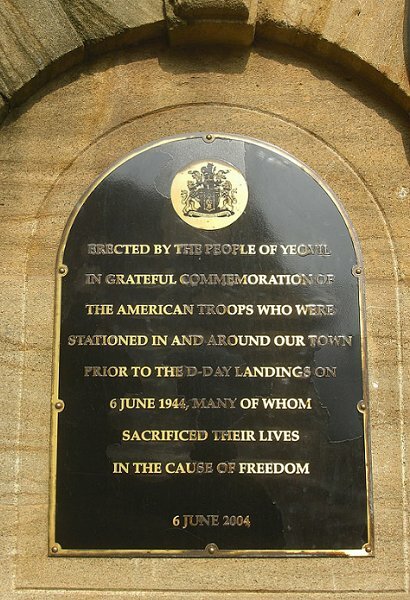 Mounted on the wall of Lloyds bank, facing the Borough, is a plaque commemorating the 12,000 American troops who were stationed in and around Yeovil during the build-up to the D-Day landings of 6 June 1944. The bank acted as the payroll department for the American troops and financed the plaque project. 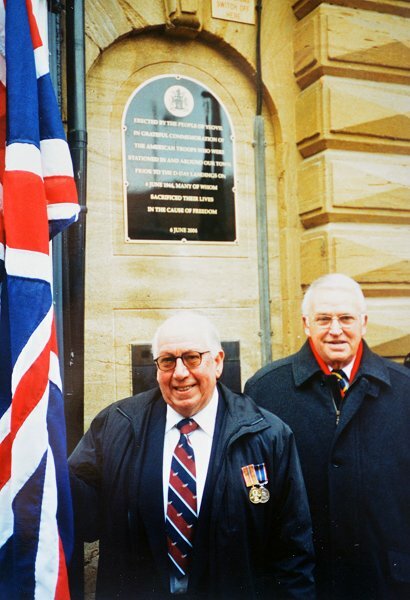 The plaque was unveiled in a ceremony performed on Sunday 5 December 2004. Colonel Gilder of the US Air Force, photographed below, represented the United States Embassy and gave a moving address to the crowd ".... 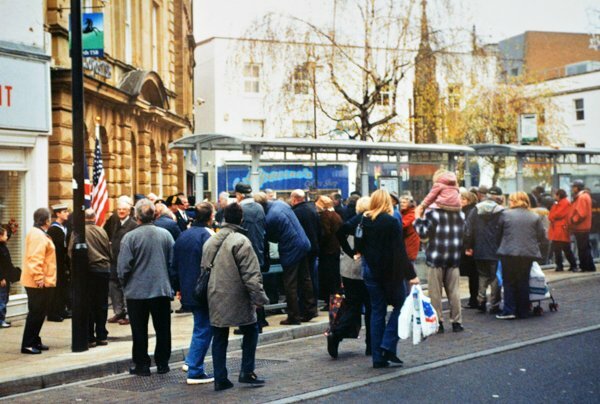 The US servicemen of 60 years ago were welcomed by you into your town as they prepared to take part in the D-Day landings. I find this a humbling experience as you honour my fellow servicemen who were based here 60 years ago." A working party was set up by the Town Council to oversee the project that included local historian Graham Toms and Tony Robins. A newspaper article of the time stated "The historian [Graham Toms] has worked with South Somerset district councillor Maggie Foot, town clerk Rod Curtis and Tony Robins, who instigated the project.... Mr Toms said 'The idea for the plaque was mooted by local man Tony Robins who, along with myself, has so many happy memories of their stay in our town.' ". 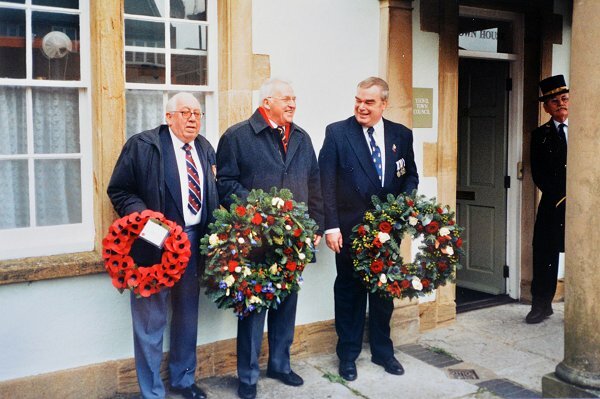 Mr Toms also contacted fifteen veterans or their widows and told them about the plaque. He collated quotes (see below) of their appreciation which he included in an exhibition at Yeovil library. 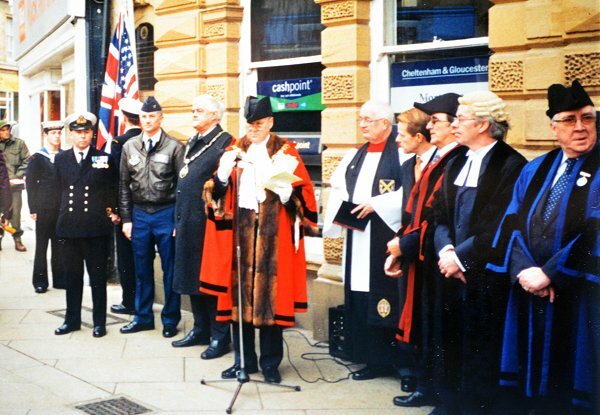 Graham and his wife Marian visited America in 1997 (and again in 1999) to meet up with some of the veterans and were astounded by the warm welcome they received - and their story made front page news on three daily newspapers. "Many thousands of American soldiers (I think over 10,000) were stationed in and around Yeovil prior to D-Day - at Barwick Park, Houndstone Camp, the Fair Ground in Salthouse Lane, Martock, Bradford Abbas and Mudford. Also many houses in Yeovil were requisitioned. They were very generous to the local children, giving us food, sweets and chewing gum - the call was "Got any gum, chum?" Also 'K' rations (boxes of mixed food, etc. for emergencies) and nylons for the girls. How and why these men came to have stockings in their kit bags was a mystery to us young boys. They were young and very friendly; I remember some coming to our house for Sunday tea. One sergeant came from Boston, Massachusetts; I think he had a Polish name. He gave me some postage stamps from his home town. It was quite exciting when they collected the payroll for their troops from Lloyds Bank in the Borough once a month. An armoured car pulled up outside the bank, which was then surrounded by American military policemen with Colt 45s on their belts and Tommy guns at the ready, just like in the movies - very heady stuff! One night the Yanks tried to drive a jeep down Lovers' Lane and got it stuck half way and they had to reverse all the way back. My father, Harold Robins, had a paper shop on the corner of Beer Street. I was not quite twelve years old and every afternoon after school I cycled up Hendford Hill to Barwick Park selling the Evening Standard to the American soldiers. I had a special pass signed by the Camp Commander. There were about five thousand camped there, all very young and friendly. Then one day in early June I went to the camp after school and they had all left - the whole place was completely empty. No-one had told me it was D-Day! But I still managed to sell the papers to all and sundry, shouting "Invasion in Europe imminent!" before I got back to the shop. Although it wasn't actually in the papers I had to sell them, otherwise dad would be cross. I now understand they all went to Weymouth on Sunday night and many embarked for 'Omaha' beach on the coast of Normandy in France, where they sustained the highest losses. The total on 6 June was 5,400 casualties of which 'Omaha' beach had 2,400 including 1,000 killed on the first day. Some of the same young men I had sold papers and talked to only a few days before. So very sad. On the Wednesday afternoon of the invasion we were playing cricket on our school playing field (where Goldenstones swimming pool is now situated) and the whole time bombers, Dakota transport planes and aircraft towing gliders were passing overhead towards France. It was an amazing sight with broad white stripes like pigeons painted on the wings to show they were allied aircraft. The end of the war was a bit of an anti-climax; blackout restrictions had been lifted on 18 September 1944. The war in the Far East against Japan still went on, shortages and rationing became worse, bread and potatoes were added, rationing did not finally end until the 1950s. Shortages still went on, power cuts, water tuned off at night. I didn't taste tinned fruit until I went to Egypt in 1952 with the RAF during my National Service. Hard times.... but at least we were alive. One of the lasting memories of that time was the prisoners of war coming home. Thin, pale, some yellow skinned. One said "I never want rice again. Ever." Although glad to be home they remained depressed for a long time. Perhaps thinking of their lost youth and the friends they had left behind, buried in some foreign field." 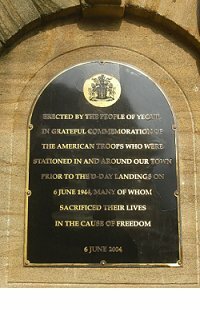 The plaque commemorating American troops stationed in and around Yeovil prior to D-Day. The plaque is mounted on the wall of Lloyds bank and faces the Borough. Photographed in 2014. Colonel Gilder, of the US Air Force, representing the United States Embassy, takes the salute. Colonel Gilder gave a moving address to the crowd. Also present were Mayor of Yeovil Ian Martin, SSDC Chairman Nigel Mermagen, the Rev. 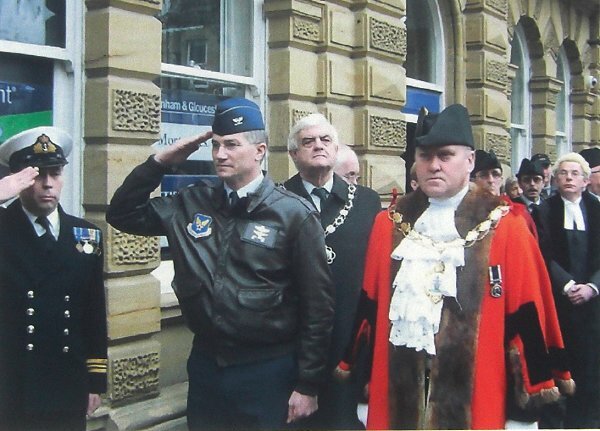 Ivor Hughes of St John's church, Commodore of RNAS Yeovilton and a representative of the Royal British Legion. 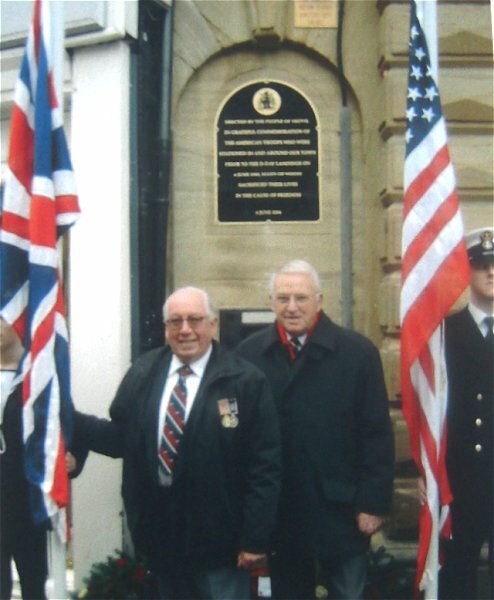 Tony Robins, at left, and Graham Toms in front of the plaque they tirelessly campaigned for. 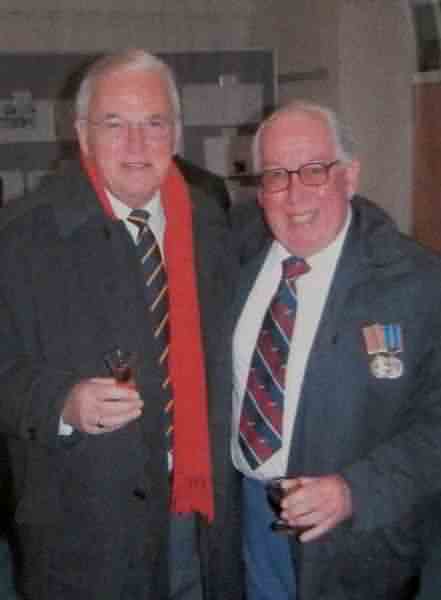 .... and having a small sherry before the unveiling ceremony. Troops from the 430th A.A.A. 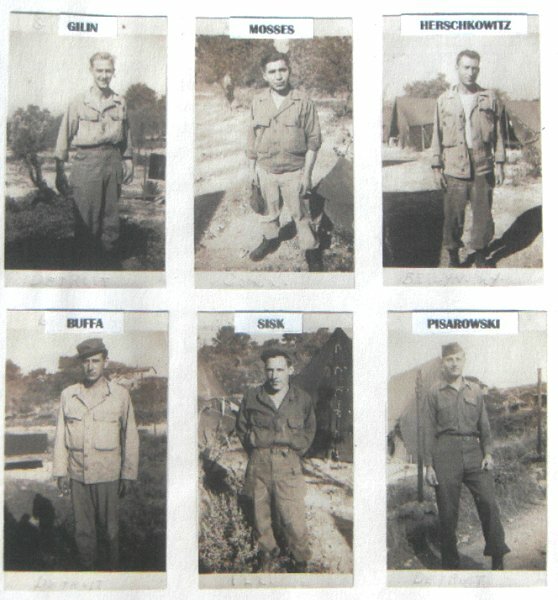 Auto Weapons Battalion (Codename 'Verdict') of the US Army 'B' Battery on 8 April 1944 in the field now occupied by Goldenstones. 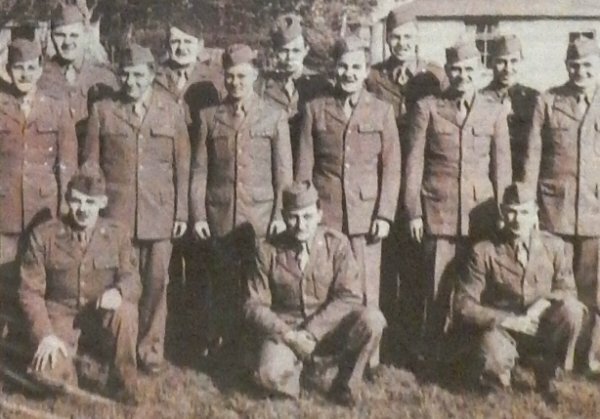 Photos, kept by Tony Robins, of some of the American troops stationed in Yeovil. 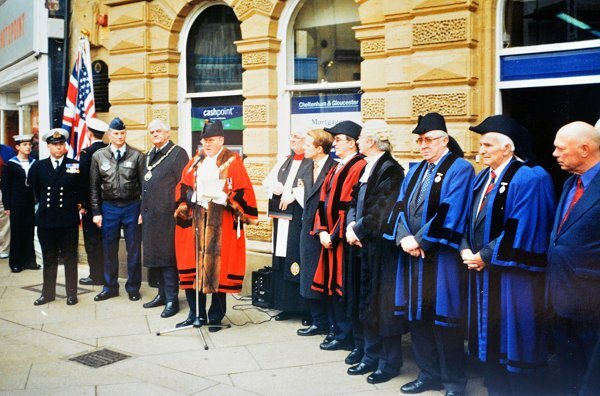 Many thanks to Jack Sweet for the following series of photographs of the unveiling ceremony on Sunday 5 December 2004. Waiting to move off from the Town House in Union Street. 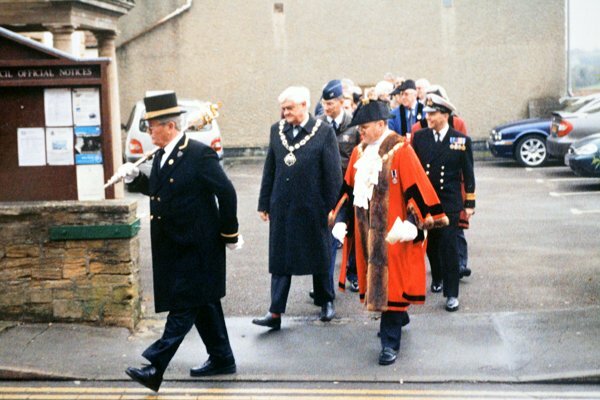 The party of dignitaries sets off from the Town House. .... and after a short walk assemble outside Lloyds bank. The Mayor said a few words. .... while the crowd looks on. Tony Robins and Graham Toms proudly pose by the plaque after the ceremony. 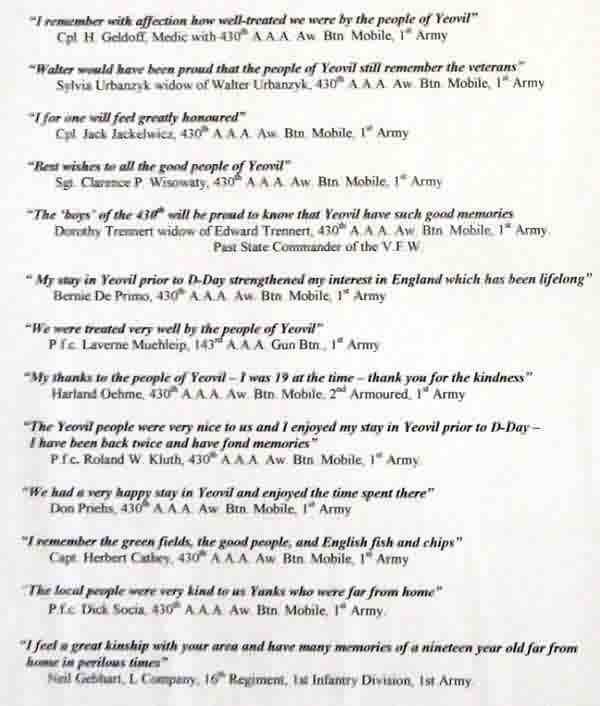 Responses from American veterans that were stationed in Yeovil prior to D-Day, or from their widows. Collated by Graham Toms.